1962 | What happened in…. An audio cassette is a kind of cassette which can store music and sounds. It is used with a “cassette player” or “cassette recorder”. 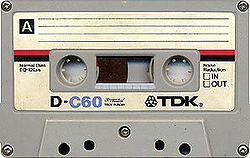 Cassettes store the sound on a magnetic tape that is wound around the two reels in the cassette. The standard audio cassette was invented in 1962 by the Philips company. They named it the “Compact Cassette“. The first cassettes and cassette recorders were not very good. The quality got better, and during the 1970s the cassette became a popular way to listen to music. During the 1980s, they were even more popular. The Sony Walkman helped this.